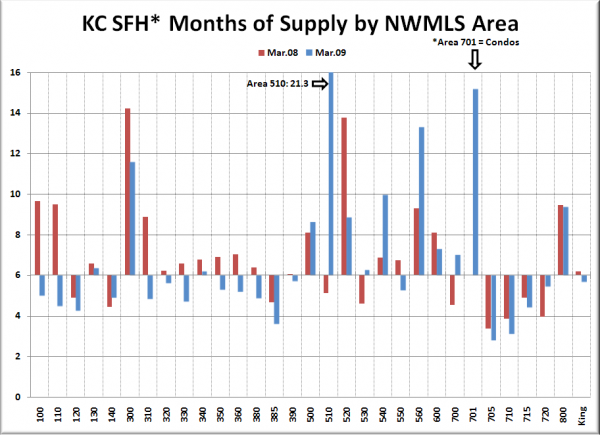 Here’s your look at March’s “Months of Supply” for the 30 NWMLS areas in King County. For an explanation of what months of supply means, please refer to the original neighborhood MOS breakdown post. Also, view a map of these areas here. 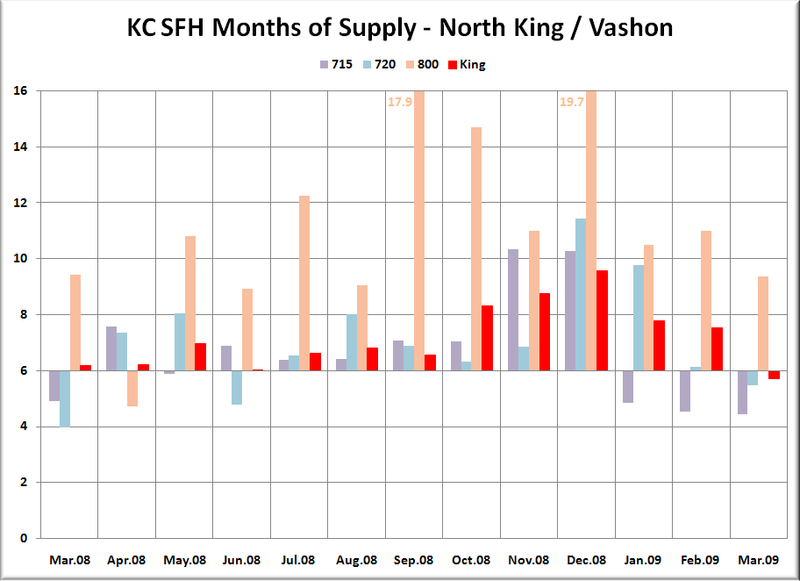 March MOS for King County as a whole dipped down into so-called “seller’s market” territory at 5.70 (compared to 6.19 for March 2008). The record run of county-wide 6+ MOS has ended at eighteen months. In the graphs below, you’re looking at the MOS for the “Res Only” data from the NWMLS King County Breakout pdfs for the thirteen-month period of March 2008 through March 2009. The bar graph is centered vertically on 6.0 MOS, so that it is easier to visually tell the difference between a seller’s and buyer’s market (i.e. – shorter bars mean a more balanced market). The charts all have the King County aggregate figure plotted in red on the far right. We’ll start off with the chart that lets you directly compare each area’s MOS to its value one year ago. March 2008 is in red, and 2009 is in blue. Following below are the breakouts for SW King, SE King, Seattle, N King, and the Eastside, as well as a summary of this month’s data. Note: For Area 701 (Downtown Seattle) we’re using condo data. The cumulative MOS for Seattle proper dropped well into “seller’s market” territory at 4.5, while the Eastside as a whole dropped slightly, but remained a “buyer’s market” at 8.4. Only eight of thirty neighborhoods trended more toward a buyer’s market than a year ago. Four neighborhoods still came in above 10 MOS (two fewer than last month), firmly in buyer’s market territory. The three toughest markets for sellers were Mercer Island (510) at 21.3, Downtown Seattle condos (701) at 15.2, and Kirkland–Bridle Trails (560) at 13.3. Along with the county-wide stats breaking their 18-month streak of 6+, 520 also broke its 18-month streak of 10+ MOS, falling to 8.8. The three best markets for sellers as of last month were Ballard/Greenlake/Greenwood (705) at 2.8, and North Seattle (710) at 3.1, and Central Seattle SW / Beacon Hill (385) at 3.6. I’m in 720 and wondering what the hell happened to all the inventory over the past few months. Nothing but ‘For Sale’ signs around where I live. I track sales weekly, Thursday through Wednesday. For the 7 day period prior to 4/22, KC had a very good week with 532 sales. MOS for the week came in at 4.25. The 7 day period ending 3/11, there were 349 sales. The Seattle Metro area (NWMLS 140,380,385,390,705,710,715,720 had 199 sales last week coming in with 2.69 MOS. The previous week Metro had 3.3 MOS. The price range between $300 and $500 had 1.9 MOS. All Metro price ranges under $500k have less than 3 months MOS. The Eastside area (NWMLS 500,510,520,530,540,550,560,600) had 5.47 MOS with 158 sales. The previous week the ES had 160 sales with 5.35 MOS. 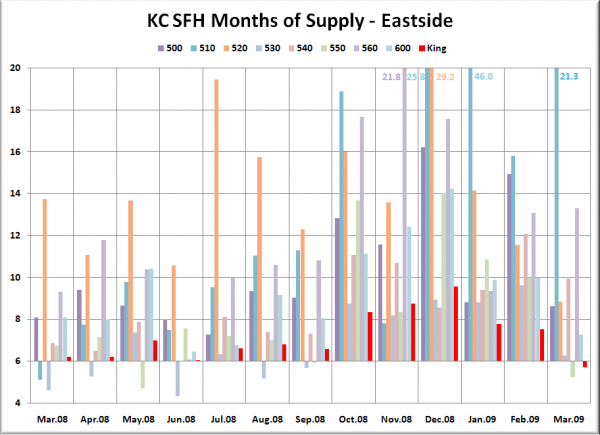 Price ranges under $500k on the Eastside now have less than 3 months MOS. Anecdotally, multiple offers are happening throughout the core areas on well priced properties. Prices are escalating in multiple offers. Pending sales are sticking better. Pendings = pending sales with a pending date starting during the stated 7 day period. I saw the jump in sales immediately that first week. One week, however, does not make much of a difference. I have been watching the demand and ratios very closely to see if they stuck….and so far they have. Inventory is absorbing BUT I believe there is still plenty of pent up seller demand and REO’s to come. If the trend continues, the newly listed REO’s will go up in price (first through competitive offers, then with higher initial listing prices). Sellers still need to price on the sharp side, but they are enjoying higher odds of selling. Same here. If I were forced to sell (“forced” being the operative word in a market like this) I might not have to let it sit on the market too long. As far the price of the sale would be though…..my 20% down payment is probably long gone. Isn’t this an effect from builders going bust?? Every builder has halted or nearly halted all building. I work in Commercial contruction and while current jobs are continuing there are virtually no commercial projects slated for 2010 construction season outside of Public work. This is cause inventory to artificially fall but as severence packages run out, savings run dry and layoffs continue, I don’t see a rebound near. Excuse me if i’m missing something but is there a way to see if inventory fell due to sales or if it fell due to sellers giving up, flippers going bust, builders going bust? Just did a quick check for condos in the Puget Sound Area over 800k. There are over 320 listed….not including all the high-rise inventory not listed. Looks like there were about a dozen sales over the last 3 months over 800k. I’d be willing to bet that there is more than a 10 year supply. Would you care to check my findings Greg? Remember…you need to back out all the commercial “sales” and the apartment complex sales that skew the numbers. Don’t listen to anybody that regurgitates MLS numbers…even TheTim. Because nobody fact-checks their numbers to see where the “bad data” is. What bad data you say? I could go on and on and on…but there are 60 of these “bogus” sales on this complex alone. The MLS and the NAR will present faulty data in order to skew sales, $ psf etc. etc. We still have between 9 months and 12 months of new construction inventory at the current rate of sale, depending on the area. You are thinking in the right direction, however. Once this N/C inventory is substantially gone, there will be a hole in new construction supply until the next wave is ready to list and sell. As for current ratios, demand (sales) is what is driving the current inventory absorption. As I mentioned above, there is still plenty of pent up seller demand and reo’s to come. However, right now, the rate of sales are greater than incoming supply. On the link I posted above, you can see the supply and demand numbers from 2007 and 2008 to see perspective. In 2007, we still had not felt the effects of the looming mortgage crises that hit hard in 3rd quarter 2007.
comparisons vs. the worst march on record in 10+ years are pretty suspect, IMO. Improvement is relative. 2008 was one of the worst. 2007 was one of the better March’s on record. Granted, this next link is for Eastside. March 2007 was the 2nd best in the last 6 years (which includes the hot markets). 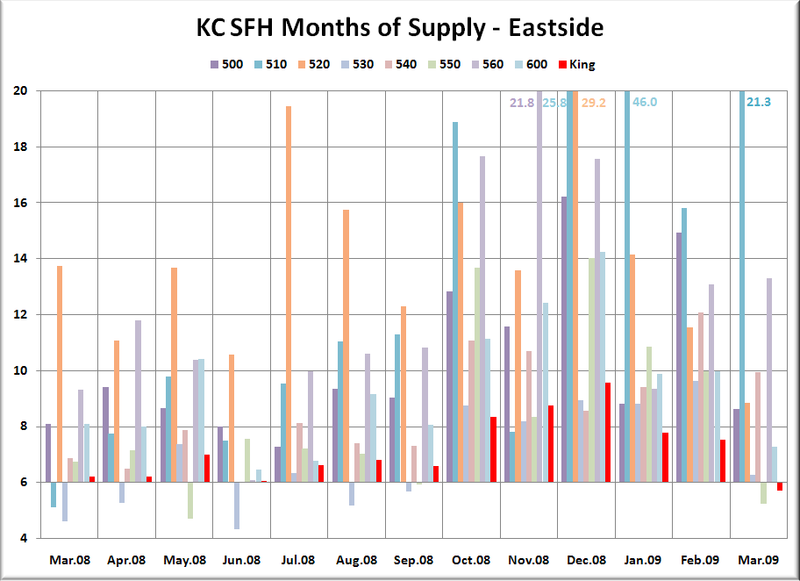 Here you can see the raw volume of pendings for the Eastside over the last 6 years. If we continue the rate that we’ve seen for the last couple weeks, we’ll come in with around 700 for the month. Not a bad month on the demand side historically when compared with monthly pending volume over the last 6 years. And, if you’re ambitious, you can dig in to see the relative MOS and percentage of pendings for the various price ranges against the total pendings (and how they changed over the years). There is a theory I have heard at meetings that the lack of building will tighten supply. You have offered a very true point that the lack of inventory may well be that lack of building. New units, in the past, were coming on the market a hundred at a time. A point I would like to make is that many jobs were lost when construction stopped. Many transient laborers left the area. I don’t know where they are going but Seattle seems to be running out of construction jobs. There are 288 Active listings and 20 Pending listings at $800k and above.. I looked at each pending and they look current to me. 4 of the Pendings were from before the first of the year. BTW, the highest priced pending listed was 11,000,0000. There was also one listed for 4,785,000 and one for 3,295,000. Real estate statistics are never perfect, and trying to make sense of them from any of the local real estate company websites is worse. All of the stats that I’ve chatted about in above posts are for residential, not condos. TIM: PERHAPS YOUR CHART DATA MAY NEED TWEAKING? I heard today that nationally sales went way down, but ironically the price of avg US homes went up [Seattle area too?]. I scratched my head too. It tells me that perhaps the horrifying home sales rate did get even worse, but that the only handful of actual sales, were to dummies [how can I sugar coat it? ], clearly paying way too much. The home supply decreases your chart documents may be artificial and only reflect mass homes pulled off listings, because there weren’t enough dummies to go around? Do you have monthly data on de-listed homes or sellers giving up? Upon further review of your redfin examples, those examples and statistcs WOULD NOT appear in the mls as such. The info presented by redfin is a blend between MLS and County sales information. It appears you have a raw real estate sale, blended with finished condos. No wonder you can’t make sense of it! Your bad data is NOT bad MLS data. It’s OK to relax, now. I can only tell you what I see. What do you mean by a “raw real estate deal blended with condos”? Selling a 60 unit apartment complex for $4,800,000 is one sale….not 60. Garage and storage units should not be counted as individual sales. Who is the party that’s responsible for these “irregularities”? I see plenty of fudging with SFR’s also where the house sold was a new one but the house listed as sold is the one that was scraped off the lot. It really doesn’t take me much time to bring this to light on a monthly basis so don’t worry…my blood pressure is ok.
And just to let you know…I’m not placing any blame on you Greg….you just happen to be the agent that is around. I’ll try to work through this. The examples you picked up from the Redfin site duplicate $4 mil plus entries would not appear in the MLS. It was either a private transaction or a commercial transaction that was a raw land deal that the developer/ builder purchased for his condo project. So this transaction whether you see it once or 20 times will not appear in the MLS stats that either Tim or I use. When the builder developer completes the project and lists the units, they will appear as active inventory for whatever they want for them, say the price is $300k. They will appear as first Active, then go Pending when they are sold. Garages and storage units and parking lots will also not appear in MLS stats. There is no field for them as stand alone entities (no field, no data). But one can buy a parking space in a condo project that will appear as a transaction in county records. Who is responsible for the irregularities? — The irregularities will not appear in MLS stats. This is a case of data confusion. It appears that Redfin pulls information off county records in addition to the MLS. In this case you took your data from Redfin. In particular , this data appears to have come from county records, not the MLS records. What happens is, for every unit in the complex, the Redfin field picks up the $4 mil + purchase price for the underlying land. I don’t think they’re doing anything wrong, although I wouldn’t choose to display information in that way. Now, I am not saying the MLS information is perfect. It never will be. I will say that MLS information is darn good and getting better all the time. Improving database corruption has been a big deal for the last several years. There really is no conspiracy data corruption plan to make stats look better or worse than they are. The stats are the stats. We can argue what they mean and where they are going, but Tim is giving you straight stuff on these charts. From looking at markets, I’ve said it many times, MOS for me is the best measurement for understanding the past, the present and looking at trends. Prices follow supply/demand as the ratios go up…or down. In this market, overall medians are horribly influenced by the lack of high end sales. Granted, this next link is for Eastside. March 2007 was the 2nd best in the last 6 years (which includes the hot markets)..
Greg, we generally talk about King County on this blog. So 2009 was worst. 2008 was only slightly better, and 2007 was worse than any year since 2002. 500 sales per week for a month will be ~2,200 sales. on any relative basis, that is low volume. Deejayoh, you already know the resolution to that apparent contradiction, I’m sure. 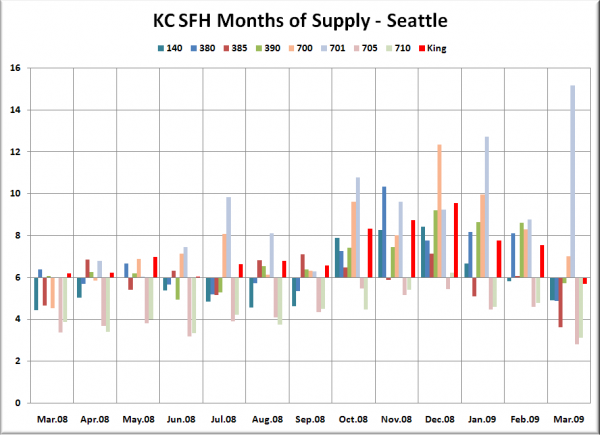 King County as a whole may be in a bad spot, but–say it with me!–Seattle is Special! RE: Greg Perry @ 3 – If things are really getting better for sellers on the Eastside, should we jump back in? Our home has been off the market for several months. If we go back on, it would be listed for between $400,00 – $425,000 based on a market analysis an agent did for me a month ago. We still hate the place, still can’t afford it, but still hate the constant parade of inconsiderate agents being on the market would bring. However, if I thought it would sell faster this time (we were on the market for 10 months 2008-early 2009), I would be tempted to re-list…There are only 5 homes for sale the same size as ours in this general area, priced from $500,000 – $400,000. Any and all opinions from the wise and foolhardy among you SB’ers will be appreciated. And Tim, I hope this is okay to be posted here and not in the forums—but as noted by others, post volume is down. Perhaps I can wake someone up out there! Are your numbers SF Res only? or combined SF Res and Condos? As I mentioned above, the switch turned on the last week of March. 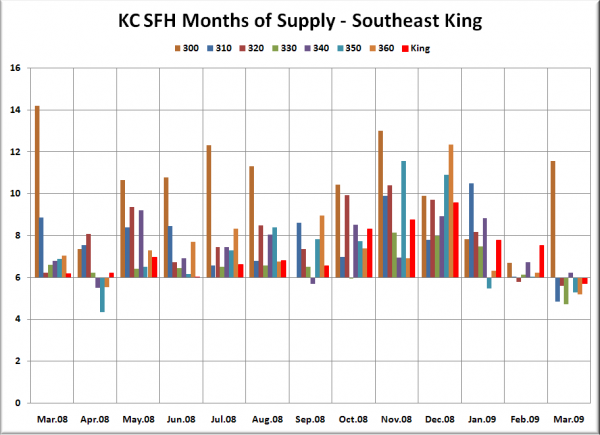 It looks like KC will easily average 500+ pendings / week. I agree, we will see somewhere around 2100 to 2200 Pendings for April which is very representative for demand volume for this time of year. You’re one of the pent up sellers that I was talking about! You’re in a good price range. The market is improving and so are your odds. 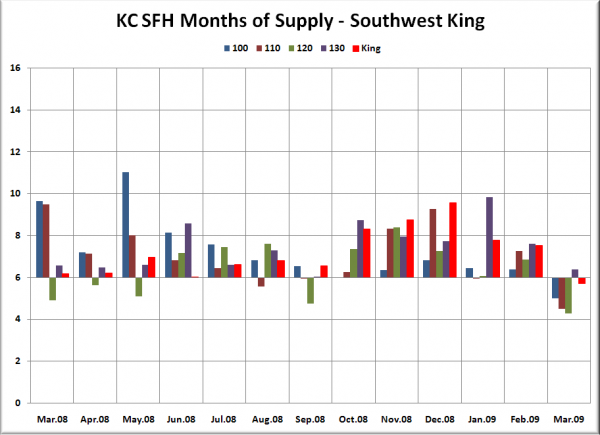 Despite better demand numbers, supply numbers are still higher. A careful analysis will have to be done for your specific neighborhood and house style. Split entry homes will be softer than a rambler, for instance. Comparing 2200 sales to previous years and saying it is low doesn’t really reflect how strong that number really is. The whole conveyor belt of people trading up to larger houses is shut down right now because so much equity has been wiped out. So even if the number of sales is lower than previous years, those sales are concentrated in only a part of the previous market. If I may be presumptuous, it sounds like lilypad wants to trade down. That’s common for empty-nesters, but it will be interesting to see if that is going to be a broader trend with the pent-up sellers. I would expect most pent-up sellers are going to be trading for another unit, so their overall impact on supply vs. demand will be mostly neutral. If sellers have cash and trade up, that will help in higher price areas, but if a lot of them are selling to reduce their costs, that will make prices fall at the high end and tighten demand even more at the low end. Finally, finally someone who “gets it”! I’ve been working on this for several weeks. What pending sales we are getting (and demand IS good right now) are extremely weighted on the bottom of the market. The second tier move up buyer is AWOL. The high end is abysmal. To sell in the high end requires a deep cut. The market is compressing…..
As we went through the mid 2000’s the percentage of pendings to total pendings rose steadily. It is now declining. Normal median price measurements have been affected significantly. If this trend continues, the bottom end will stabilize and start to rise, the top end will continue to fall. I am working with a high end finish carpenter who is having a hard time getting jobs and wants to trade down! This data is worthless. From now on I only care about Beeson’s Real Time Market(TM) data. Would be interesting to see the supply numbers tiered. Seems like there is a LOT of inventory at the higher levels….and with trade up buyers gone……look out below. I can understand what a PITA it is for everyone to try to interpret the data. I’m not a computer geek but I find that Redfins “solds” have to be dug through to get the whole picture. So it sounds like people are saying that while the market at a whole is far from bottoming out, the low end of the market in specifically (we’ll call it the under 250k market) seems to be largely done fluctuating? Would this be a good time or a bad time to buy a 200k home? I think that that really depends on the home you get for $200K. If you are assuming that the other sectors of housing are going to continue declining over the next X months, then I would think that you could also assume that you could get more house for $200K in X months. RE: jon @ 25 – We do want to trade down, but out of financial necessity, not because we’re empty nesters. (We have one young child.) We bought at the peak, qualified on one perfectly honest income (no liar’s loan, etc.) but completely overextended ourselves. Two years later, that one income is $20,000 less and even if I could find a job in this economy, I am unable to work because of health reasons. If we do sell, we will rent. There is simply no money left to buy a home, even if we wanted to, and after reading this blog over the last year, we don’t! Our home is small and would be good for first time home buyers, or empty nesters who are unloading a McMansion. When we were on the market before, there were tons of visits, but no offers. I think people were waiting to hear what plans the government would come up with. Perhaps now, they’re buying into the propaganda that it’s a good time to purchase, and are more likely to jump in. That’s probably wishful thinking on my part, though, and I’m not even a real estate agent. You need to have an agent who works in your area and has been in the business for more than twelve years. They should be some one who can short sale the property if need be. Put the house on the market and reduce the price until it sells. The reason you need a seasoned agent is to get other agents involved with what I know will be a good deal for somebody. Agents know agents and that makes the Real Estate world go around. Alienating agents will cost you time and money. Ageints also respect some agents. You’re paying a commission so get the top agent in your area. As we went through the id 2000’s the percentage of pending sales over $600,000, to total pendings rose steadily. It is now declining. The profession is a bluff. Then you haven’t met me. I have doubts about my sharpness, but decency I’ve got in spades. The move-up market is indeed dead. You need only look at the statitics that started this topic – the traditional “move up” neighborhoods (e.g. Central and West Bellevue, Mercer Island, the horse-acres in Bridal Trails) have tons of inventory. Recall the January statistics when MI had 46 months of inventory? Eeek! That number is down to a (still horrible) 21 months becuase all those houses got taken off the market, not because they sold. Sellers in those neighborhoods, and in that price bracket are in for some painful realizations in 2009 and 2010. They have been waiting and hoping prices will stabilize, but in the meantime their target buyers have seen their equity (i.e. their down payment on the move-up house) disappear. Thus, the number of buyers is down. Those that are left are the people who were wise enough to sit on cash during the last two years. Those buyers are not likely to suddenly become stupid investors with that cash or with an income stream. They are on strike until the sellers realize that their properties have gone down 15-20% just like the rest of the city. It would be interesting to see how many of the listings at the high end are people who are underwater. Some of those people don’t have the cash to pay off their mortgage if they accept a lower offer, and they can’t walk away because there is enough money at risk to make it worth it for the banks to go after their other assets. If that is the case, then those prices won’t be coming down unless things get much worse than they already are. I hear that the only serious buyers in that range are people relocating in from elsewhere. That number could change depending on how Microsoft and others do in the coming months. Which way this breaks out at the high end depends more on the economic outlook for local companies than it does on the MOS at the current low level of sales. I was using numbers from a 6 year report BY QUARTER. The MLS numbers come out quickly. It takes Trendgraphix at least 2 weeks as they do some manual corrections to the pending and solds data. The corrected data is always slightly more conservative. I just LEARNED that the 6 year report AVERAGES the numbers for the quarter. 874 – 1031 – 1563 averages to 1156 (which was the number I was using for March 2009). The 6 year history by quarter is a recent report offering. So now I know! There’s too much noise in the data. I think a rolling 3-month figure would be easier to read. Tim, may be you could add those next time? Or can you provide the raw number with sales and listings? Thanks! I hear that the only serious buyers in that range are people relocating in from elsewhere. That number could change depending on how Microsoft and others do in the coming months. News yesterday for MS was not good – first revenue decline in 23 years…. yeah. that only drove the stock up 11%. I’ll take that bad news every day! This is the type of BS that makes people dislike Real Estate agents. You’re buying a house from the seller, not the agent. My agent’s relationship or feelings about another agent should play no part in how he presents a house to me. The only thing that should matter to my agent is whether or not a house fits my needs. Anything other than that is unprofessional, and not in my best interests. Real Estate agents need to put their petty squabbles and hurt feelings aside and do what’s best for their clients. If I ever found out an agent didn’t show me a house, or lied to me about its condition because he didn’t “respect” the listing agent, I’d be looking for a new agent. Your rant is one of the main reasons people have a hard time with agents. There are good agents. There are agents who know how to price a property correctly and negotiate an offer for both the buyer and sellers benefit. There are thousands of homes that fit your needs. Asking price is a function of how well the agent knows the market and has the ability to guide the seller. Unfortunately many people are price sensitive. The only thing that makes a difference is that the agents come to a meeting of the minds. It’s easier to get to that point with a competent agent. If it were simply buyer and seller there would be no car lots, Real Estate agents, stock brokers, medical clinics, banks, grocery stores, and the entire list goes on.